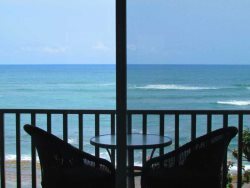 Walk out your Lanai Door to the Beach, Just Steps Away!! It was a nice condo, some cable would have been good for the evenings, but worked it out. The members of your team are wonderful. Any questions or concerns I had they were right on top of and had answers quickly. Very friendly and courteous. Very responsive to questions. Yes it did, it would have been nice to have some glass wine glasses for use in the room. Superb. More than met our expectations! Yes it met my expectations! Everything was like we expected! The condo in front of the ocean was excellent! Waking up by "the noiise" of the ocean was wonderfull. If we have the chance to come again from Europe, we will book again, sure!! !